Approach Fast Stack's modular wiring system interconnects avionic components with a central hub and ready-build cables (all cables are double shielded and grounded at the hub eliminating the possibility of ground loops) for the majority of avionics in the marketplace. 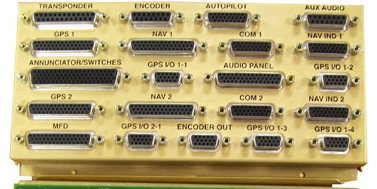 Retrofitting Approach Fast Stack wiring systems into an aircraft or building a new avionics panel is simple: select the Approach Fast Stack hub for your panel (basic, IFR, or VFR), choose the ready-built cables for your avionics, install the hub, plug in the cables (between the hub and avionics) and you're done. Approach Fast Stack eliminates time and errors caused by the hand wiring methods used today. 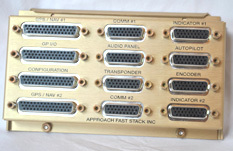 Approach Fast Stack manufactures the avionics cabling, the interface hub, and can supply the avionics that best apply to the pilots specific needs. All systems can now be completely tested before they are installed into the aircraft. In addition, the complete packages are modular from the bench to the panel providing customers fast install turnaround times and the ability to easily swap out avionics components pre- or post-installation. Approach Fast Stack provides pre-sales customer services and consultation and complete post-sales customer services and consultation and complete post-sales customer support. Approach Fast Stack's sister company, Park Rapids Avionics, is an authorized Avionics dealer for Garmin, Bendix-King, Chelton, S-tec and many other Avionics manufacturers, has been serving the upper Midwest area since early 2001. Tom Hass, owner and chief operator, has over 20 years of service in the avionics industry for light single engine aircraft to light corporate jet aircraft. You can be sure that all your service and product needs will be met at Park Rapids Avionics. Approach Fast Stack supports the strategies of both companies to accelerate market expansion for leading-edge avionics services for general aviation, ranging from experimental to light corporate jet aircraft.